I met up with some friends partaking in the annual SantaCon festivities around the East Village. Great roundup about the event at Paris Breakfast - I randomly spotted some of my sorority sisters in one of the pics! Due to some miscommunication with Ted I left my Mrs. Claus costume at home. Luckily Amanda had some antlers for me to borrow. 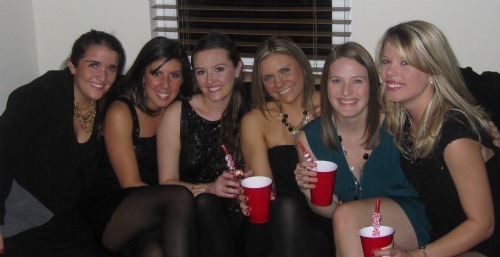 Flashback to Santacon 2010... hmmm around the time Four Loko was banned. Ted's hat and beard have gone missing. I love seeing Christmas trees along the streets in the city. 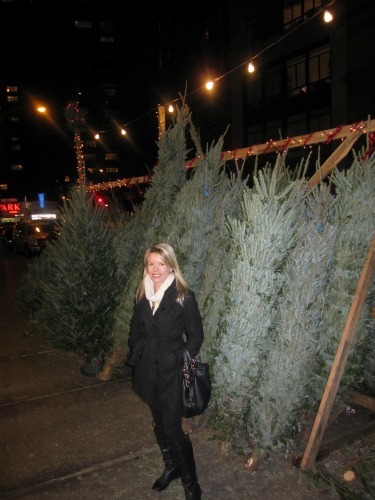 I didn't see the price tag but the trees near Ted's apartment on the UES are small (I feel like a giant next to them) and run around $50. Crazyyyy. 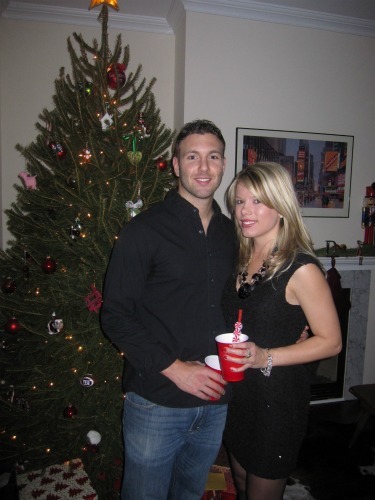 We headed to Hoboken that evening for Matt and Danielle's annual Christmas party. Great times as always. 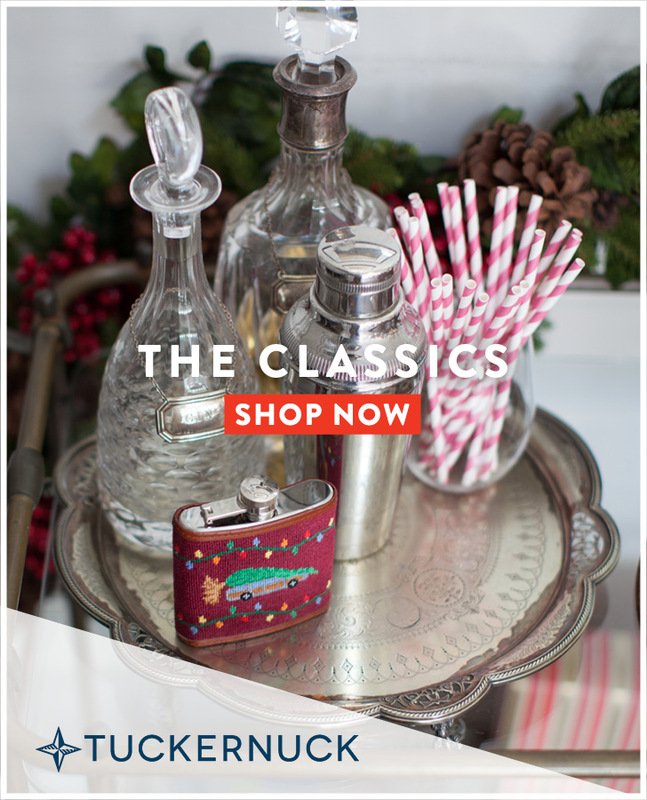 The Santa bottle toppers, popcorn tin and giant candy cane ornament are all from Target. Ted made spiked egg nog at the party... I prefer to save my caloric intake for the cheese. 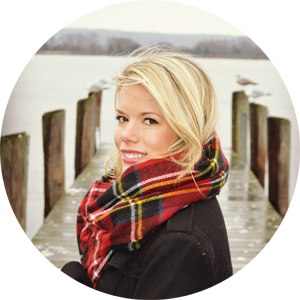 I live in Hoboken and loved seeing all the Santa outfits Saturday. We missed out because my mom was in town visiting and she wasn't quite up for SantaCon - but it looked like so much fun! The toppers are from Target - they also come in reindeer antlers. I have seen some cute DIY on Pinterest too if you're crafty! 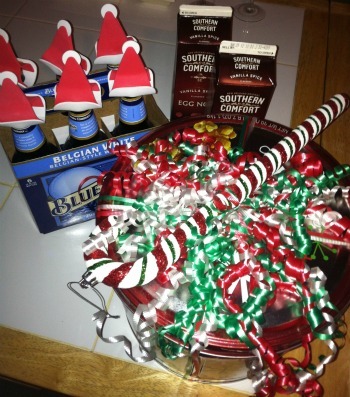 Is that SoCo Eggnog I see? I'm so addicted whether its spiked or not! Sounds like a fun weekend! You look beautiful! 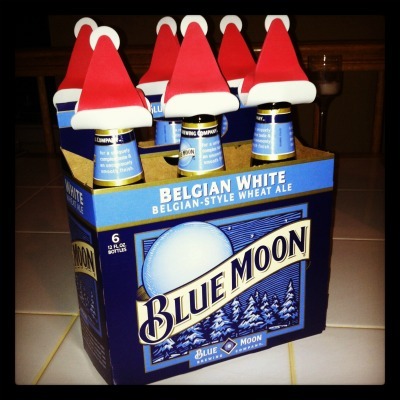 i love the blue moon with santa hats...brilliant! Cute Santa clause outfit! I just bought one similar and it's so romantic for the holiday season!